An MCTS: Windows SharePoint Services 3.0 - Configuration certification validates the skills to configure Windows SharePoint Services 3.0 and focuses on deploying, monitoring, administering, customizing, securing, and configuring a network infrastructure for Windows SharePoint Services. The successful candidate has the skills to configure Windows SharePoint Services 3.0 and has a general understanding of Internet Security and Acceleration Server (IIS) and network load-balancing for applications. This certification will retire when Microsoft discontinues mainstream support for the related technology. Please click on the boxes in the diagram below to be taken to the relevant course outline. The MCTS: Microsoft Office SharePoint Server 2007 - Configuration certification highlights your area of expertise and validates the knowledge and skills required to configure and deploy Office SharePoint Server 2007. 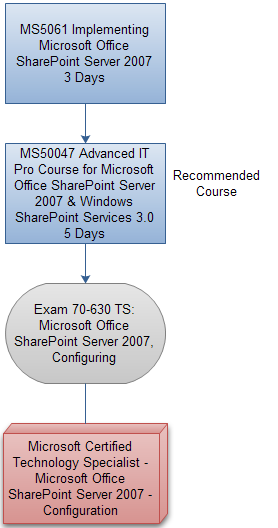 If you have the MCTS: Microsoft Office SharePoint Server 2007 - Configuration credential, you typically have an understanding of how to configure Office SharePoint Server 2007, and you have a general understanding of Microsoft SQL Server 2000 or SQL Server 2005 and .NET 2.0 as they relate to SharePoint Server 2007. To earn this certification, you must pass one exam.